The annual March Madness bracket picking experiment for the Rose brothers went slightly better this time around. Last year I posted PDF files of Josh and Alex's selections for the NCAA Tournament. For those who don't remember (I'm assuming that's all of you), Josh picked Syracuse as his champion and Alex picked the Minnesota Golden Gophers because he liked the M logo of the team. In 2010, some aspects of the picking process have changed for the boys. Syracuse is a #1 seed (up from #3 last year), Josh has watched a lot of Syracuse games this season (and is not picking them blindly) and Alex is no longer picking teams based on logos. Instead he is now a U.S. State junkie which completely influences his bracket selection process. 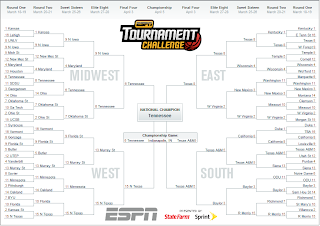 His picks (shown below - click to enlarge) feature three Texas schools in the Final Four and Tennessee trumping them all. Shockingly he has the Volunteers beating Texas A&M by a score of 1 to 2 in the Championship game. I'll let him slide on his pick of Vermont (16 seed) over Syracuse in round 1 (a state would always beat a city in Alex's book). Josh once again picked Syracuse to win it all, beating Missouri in the National Championship. In a weird coincidence, he has Robert Morris making the Final Four again (he has them in his Final Four last year as the same #15 seed they are in 2010). Maybe it's because his middle name is Robert. I expect him to watch some of the day games with me this season (depending on how far the Orange go in the tourney). Lehigh is also a surprise Elite 8 team in the Josh bracket (shown below). *Once again, these brackets are posted for entertainment use only and you should not consult them to assist in your own NCAA pool selection process (unless you are on crack). I like that both respect the Spiders in round 1. I also like that Alex is a big fan of WVU, and only a powerhouse state like Texas can knock them out. Please enter one of these in my work pool and pay $20. Please.